Sports week - now in its 5th year and still as popular as ever. Sadly this year the weather put paid to some of our activities including our traditional sports day. However, we still went ahead with the planned team games, heptathlon and, highlight of the week, a very successful circus skills day. 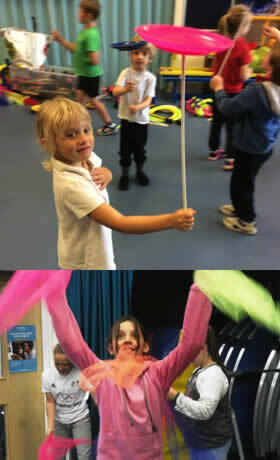 This was enormous fun as children tried their hand at juggling - silk scarves to skittles; balancing - peacock feathers on fingertips to spinning plates on sticks; doing acrobatic movements with diablos and poi sticks - a new way to develop core strength, hand eye coordination and expending lots of energy without realising it. A great and innovative way to work out. Outdoor classroom opening - we were fortunate to secure some lottery funding last year for an outdoor classroom and community garden. 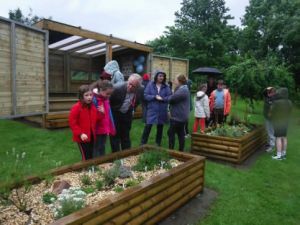 It was lovely to see members of the community turn out in very wet weather for a tour of the school grounds by some very pleased pupils who were immensely proud of their gardening skills. This was followed by afternoon tea. The new external classroom will allow outdoor learning to continue each week for all children in all weathers and we certainly needed it that afternoon. Even on a rainy day the outdoor classroom and planters look good! On the same afternoon as the opening of the outdoor classroom, we were due to hold a fundraising event based on a family fitness fun challenge with family rounders and BBQ - needless to say the weather put paid to that idea. An impromptu indoor dance off challenge was arranged instead as a bit of family fun and despite the torrential rain, the BBQ was a sell out and it was lovely to see so many parents/family/friends support us. We managed to raise £350 which will be put towards plans for the refurbishment of the school library. This time of year is always busy for our Year 6 pupils who are not only preparing themselves for the transition to secondary school, but are also busy rehearsing their leaver's service and end of year production. This year the production is ‘lights, action, camera' - once again, we have some talented actors! Well done to our Year 6 pupils who have outperformed both National and North Yorkshire performance levels this year in their recent assessment tests. This is a real testament to their hard work and perseverance and a real cause for celebration at Husthwaite. We are delighted that Mr Chapman, who has been covering Class 2 on a supply basis, will join us as a permanent member of staff in September. Teaching staff in September will be Mr Barwick, Class 1; Miss Goodchild, Class 2; Mr Chapman, Class 3. From September we shall now be offering a before school club allowing children to be dropped off at school from 8.00am. The application process for children starting school in September 2018 opens on 22nd September. We shall be holding an open morning on Saturday 14th October - everyone is welcome to come along to take a look around our school and talk to the staff. If you are unable to make the open day but are interested in taking a look around our school, please contact the school office to arrange a suitable date/time. Thank you to everyone who generously gave school their Sainsbury's vouchers - these have been spent on some lovely new playground toys. Thank you also to everyone who donated their unwanted clothing for our bags2school collection which raised £76.00 for our school funds. Another bags2school collection will take place at 9am on Wednesday 8th November 2017.